I’m not gonna lie: the one who loves this blanket the most is Kermit. 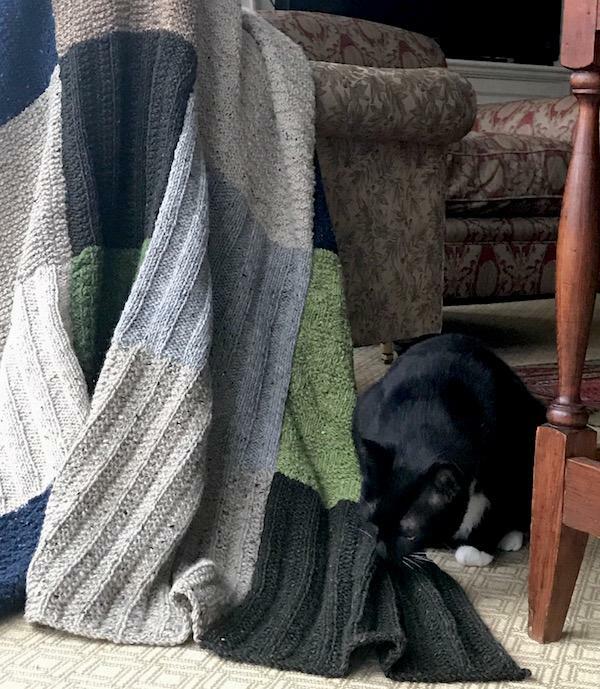 He was a total pest while I was seaming the six strips together—rolling around on the Donegal Tweed like it was catnip, nudging strips until they slid off the table, playing with my sewing yarn like a freaking kitten. He’s 112 years old. Anyway, it’s gratifying to have a lot of blanket love around. We watch the end of the world together on the teevee, so now we each have a tweedy knitted blanket to hunker down under. Remember: always seam your blankets on a large table. It’s the only way to prevent The Horror of Puckering, The Heartbreak of Overstretching. The goal at all times is to make sure the intersections intersect neat and square, like Mike Mulligan. Here’s the back side. The blanket is square, though my floor is not. A number of folks have asked for a pattern for this. Remember, the joy of sequence knitting is that you can simply think up a knit/purl pattern in your head, and go. If I were to write out the stitch patterns for all 44 squares, it would be excruciating both for me to write and for a knitter to knit. (Also: I don’t even remember at this point what I was doing for most of these.) Better to discover the many joys of cooking up sequences on the fly. You need to get a copy of Mason-Dixon Knitting Field Guide No. 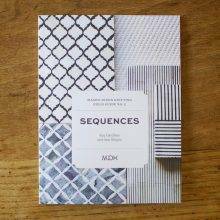 5: Sequences before you make this blanket. 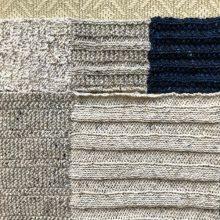 It’s essential to spend time with Cecelia Campochiaro’s ingenious methods for creating complex fabrics using simple knit-and-purl patterns. 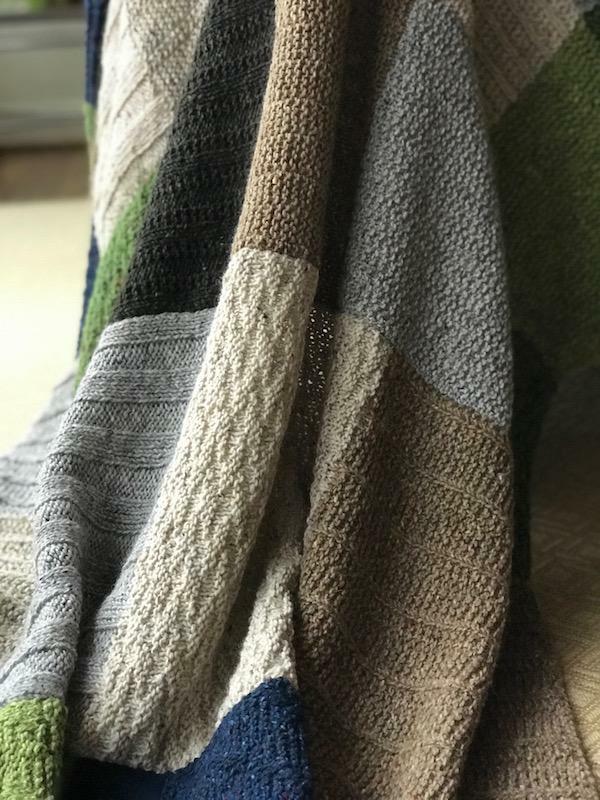 Once you understand the thinking involved in creating these stitch patterns, you’ll be able to make this blanket in a jazzlike, improvisational manner. I repeat: this is the most fun I have had knitting, ever. 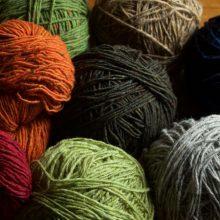 Yarn: Worsted weight. 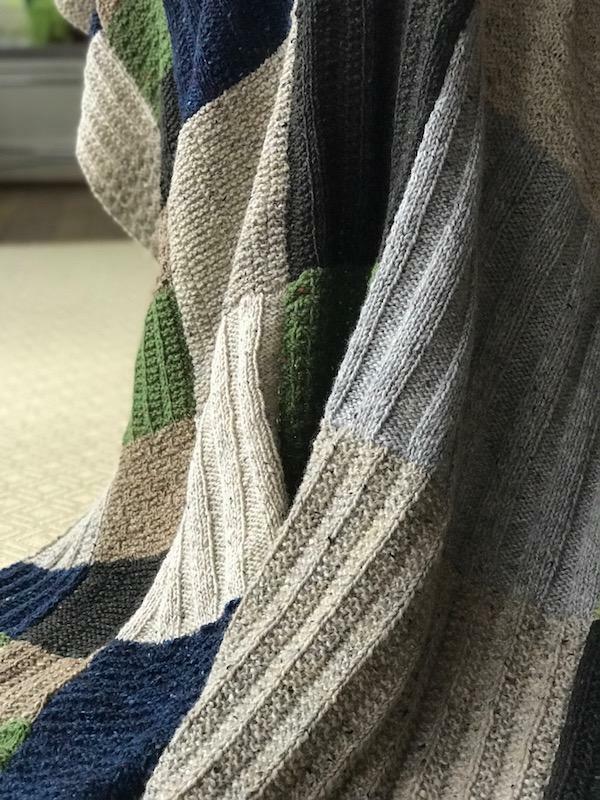 Tahki Donegal Tweed is my forever pick for blankets. It’s just the sturdiest, tweediest yarn, and it blooms when you wash it. I picked these colors from our Shop, and I used 8 shades: Light Gray, Cream, Tan, Fawn, Light Olive, Bright Olive, Dark Green, and Dark Blue. Two skeins per color. Gauge: 16 stitches = 4″ on unwashed stockinette. Pattern: Make 6 strips total. Change sequences and colors as you like. Note that different sequences create different row counts, so you should knit each sequence until you have a square—don’t try to count rows, because it won’t help you. Just keep a tape measure handy, and make sure you’ve knit a full square. 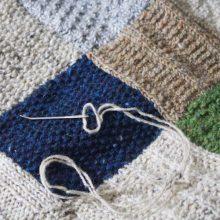 Strip of 5″ squares (make 2 strips): Cast on 20 stitches. 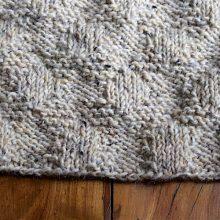 Using your choice of sequence and yarn color, knit a 5″ square. Change color and sequence. Knit another square. Keep going in this way until you have made 12 squares. Strip of 10″ squares (make 2 strips): Cast on 40 stitches. 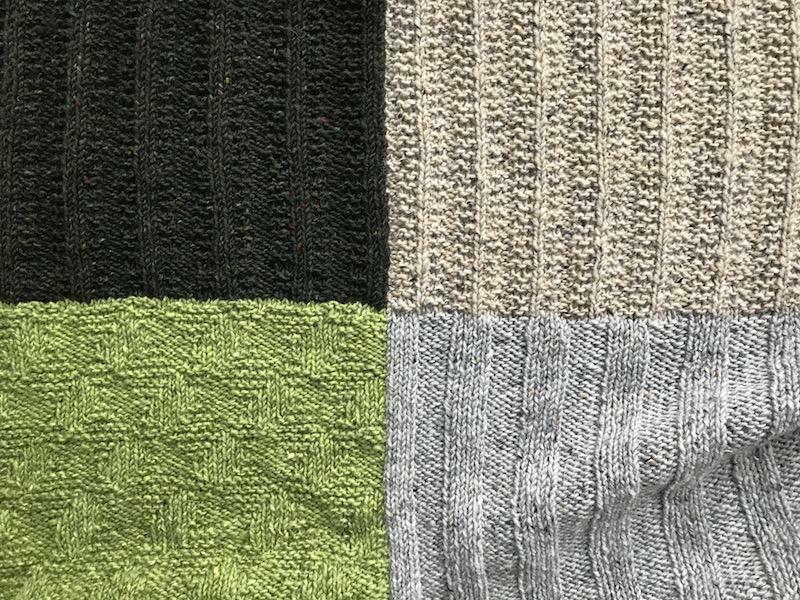 Using your choice of sequence and yarn color, knit a 10″ square. Change color and sequence. Knit another square. Keep going in this way until you have made 6 squares. Strip of 15″ squares (make 2 strips): Cast on 60 stitches.Using your choice of sequence and yarn color, knit a 15″ square. Change color and sequence. Knit another square. Keep going in this way until you have made 4 squares. Soak your strips. A bathtub is recommended. When dry (or hell, sew them wet I don’t care), sew the strips together using mattress stitch, 3-needle bindoff, or crochet as you like. Add an i-cord border if you want, though I didn’t want to do one on mine. 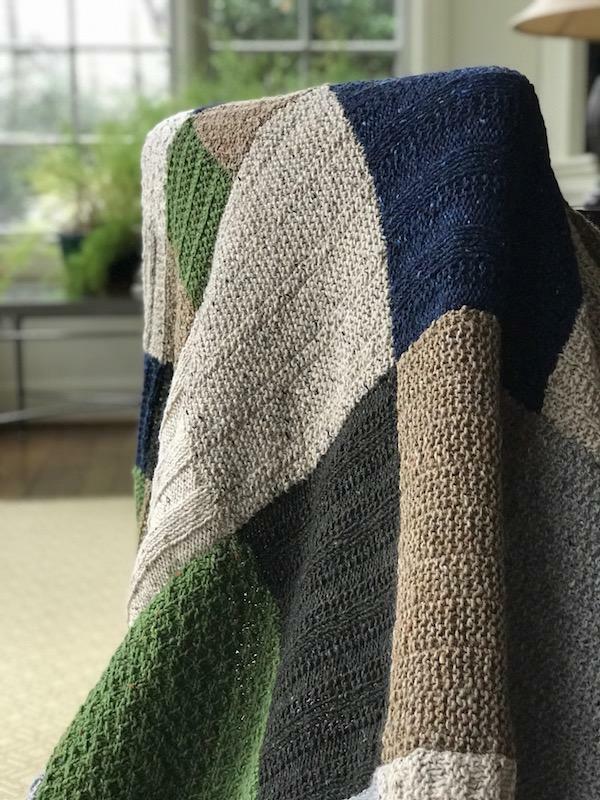 I’d dying to see what other sequence blankets will look like, so I hope some of you curious knitters will dive in. My cat ALWAYS can tell the difference between a pure wool yarn and acrylic ones. Gorgeous blanket! So does mine—Roger actually sniffs for my yarn, then gnaws right on down! I have a great method for washing your hand knits–including the biggest blanket. It works like a dream and has the seal of approval from my friend Pat who just retired as a fiber engineer at Consumer Reports. Using the manual settings, fill the washer tub with cold or tepid water. While it is filling add in whichever soap you’re using. When the tub is full, turn the washer off and add your knitting evenly distributed in the tub. Gently push it into the water until it is all submerged. Now leave it alone for 15 to 20 minutes. When it has soaked long enough, turn the washer to spin and let the spin cycle do it’s magic. The water will drain out and you will be left with some slightly damp knitting that you can do whatever you need to with it. Need to pin it out to size, block the heck out of it or simply let it dry flat, you’ll be good to go. Note: If you used a regular laundry soap, you may need to give it an extra rinse. 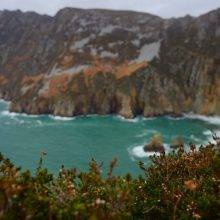 Just take the knits out of the washer (remember–we don’t want to run water on them) and fill the tub with cool or tepid water again. Submerge the knits in the water. Give it a minute or two and maybe gently move the knits around. Then spin it again. Don’t have a top load washer? Neither do I. But I have friends and family who do. I find that an offer of some nice baked goods and coffee make me a welcome wool guest. If you throw in an offer to wash all their sweaters for them while you visit, you’ll be a hero. P.S. Do this with your store bought knits too. You’ll save a fortune in dry cleaning. Thank you so much, Karen, for this detailed response! I don’t have a top load washing machine, but my parents do! I guess I am concerned about the spin cycle but spin cycle does not equal agitation and I trust you and the Fiber Engineer from Consumer Reports! Excellent advice, Karen! Thanks so much for this wisdom. Or, soak in the bathtub, spin dry in the washer. Some front-loaders have a spin-only setting, but even absent that most have some way to cancel a cycle and skip directly to the spin part (it’s not always obvious how to do this, so you may need to read your manual). Or or, soak in the bathtub, then overlap all the towels you own to roll up the dripping thing and walk on the roll, as usual. It’s not elegant, but as long as you’ve got the floor space, it works! 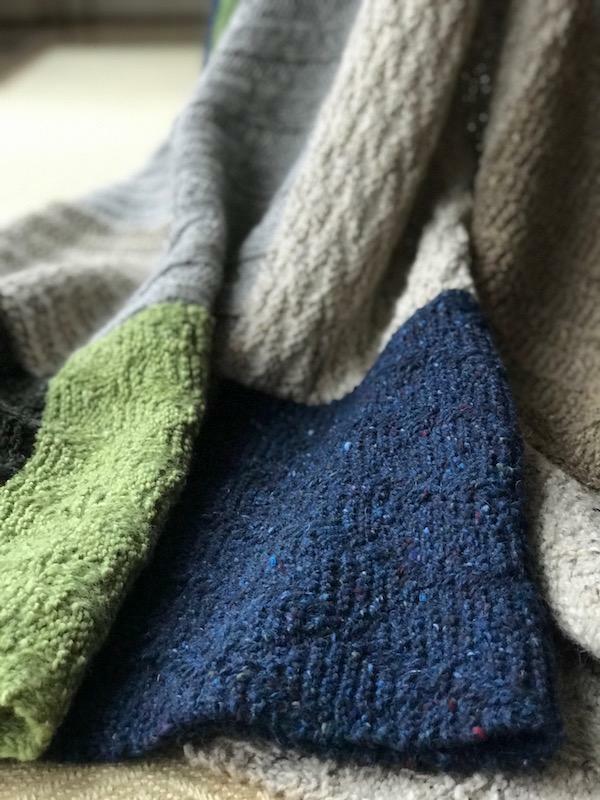 In my household, barring disaster, large wool blankets don’t get washed more than once a year (and, keeping it real, sometimes considerably less often — I spot clean small mishaps of course). It’s easier to put up with an ungainly process if you only have to do it infrequently. For those with the space and plumbing, I’ve known people to buy an inexpensive used top-loader to keep in the garage/basement and use only for hand washing woolies and other delicates (great for felting and tub dyeing, too!). Spinning is definitely the way to go. For small items, like oh, maybe some Squad Mitts, a salad spinner works just fine. Thank you, Susan! My husband asked if he could throw out the salad spinner the other day since we never use it. Now we must keep it! So great–I never thought of a washing machine as a single-use appliance, but this is perfect! Thank you, Julia! I have searched for the “Spin Only” cycle on our washing machine when we got it and was sad I did not find it. But now I know to check the manual to see if there is anything about cancelling a cycle! In my washer’s manual, it is only mentioned very offhandedly as a side note in the section describing the button in question, whose main function is something else (there’s no labeling on the washer itself indicating which button will cancel a cycle in progress). Well hidden! Truly an Olympian feat strong and beautiful. When I first leaned to knit someone gave me a worn set of copies of a “Learn to Knit”afghan. It has 63 squares. I took the copy,recompiled on heavier paper and had the copy shop put a binder and cover page do it. I have never touched it but NOW #Squadgoals. Go for it! It’s so fun! Simply stunning! Maybe I will attempt this project after all! I just love looking at all the different sequences. The eye is drawn to looking at all of them and enjoying the variety and creativity. Great project. Your blanket is beautiful! Thank you for sharing your pattern and suggestions! 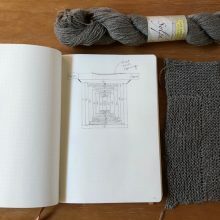 I am slowly working on my own modified logalong blanket – work, sleep and all those other daily activities are slowing me down. I will get it done though! Kermit obviously good taste. It is stunning, and looks SO cozy. 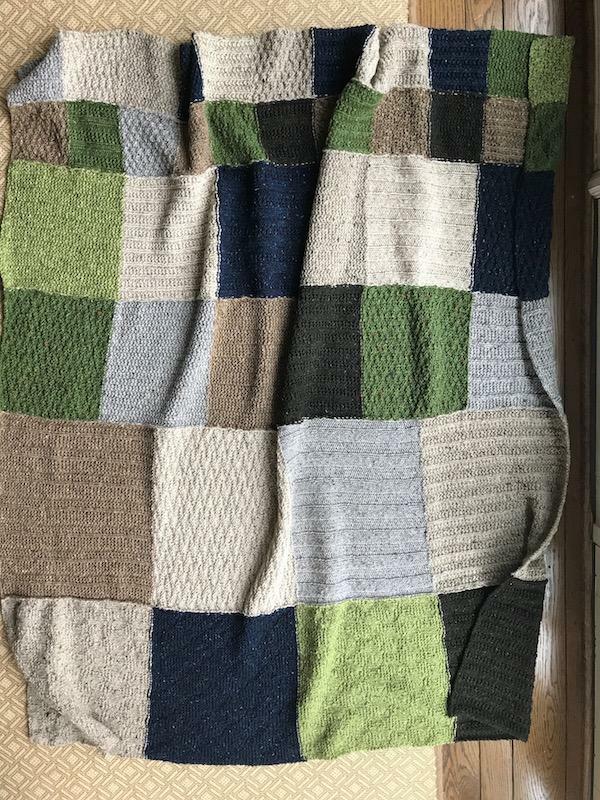 My first project as an adult knitter was a sampler afghan. The cat has it now…. Gorgeous blanket! And I love the reference to Mike Mulligan. That is a stunner! I’m fascinated by the sequence shifting. Another on the someday list for me. Love this. Would so like to do it myself, but know I’ll never get to it. So, wonderful to do it vicariously! Beautiful! Now on to finishing my Carbeth…. Kermit has wonderful taste. 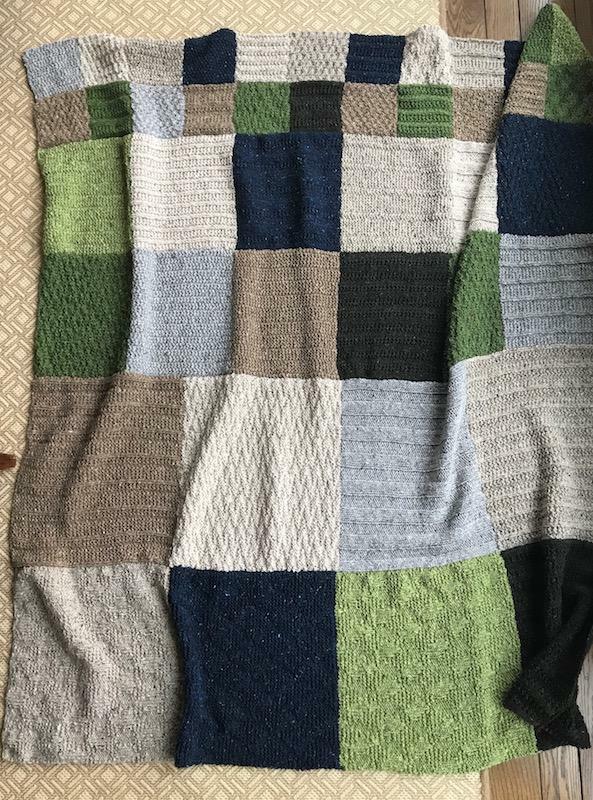 You blanket turned out gorgeous! So beautiful! I watch the end of the world on the couch with my husband, too. Gotta say the blanket is a better solution for comfort than gin…. I have been watching your blanket progress and have been smitten from first sight. I’m working on my own, incorporating your patterns, colors etc. Thanks so much for giving us a roadmap! I can’t wait to see what you come up with–please keep me posted! Ann you are so talented! It is beautiful! Both the blanket and Kermit look great! Beautiful blanket. My 3 cats also “assist” when I am knitting. Their favourite trick is to grab the ball of wool from the wool winder and run off with it when I am unwinding a skein, and Cleo announces very loudly that she has a present for me and drops a handful of unspun merino tops in my lap. Simply elegant, gorgeously done and the best of all—it looks hand-made even in its perfection! Think am going to try this . . . Thank you so much for making and sharing. Absolutely gorgeous on both sides!!! Very inspiring. This looks lovely. I might have to stash away this idea for my next blanket. Once I finish my log cabin one that is!